Still not quite being satisfied with my recordings of these 1950ish Robertson pipes, before I give them back to my friend I wanted one more shot. This time with the Inveran chanter with a new reed. The drones go out of tune toward the end, but I couldn’t get another recording out (see below for why). 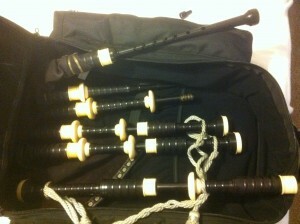 I also take this opportunity to stress how important it is to have a bagpipe set up to fit you properly. The blowpipe is about the right length, and its stock is tied in properly, but the bag is too big. Looking at the picture below, you can see my left shoulder hiked up to accommodate the bag. My shoulder was killing me by the end of the set and the muscles in my forearm were tired from ‘dealing’ with the bag. I’m not the prettiest bloke to wake up next to…oh hey, you can see my Zoom H2 recorder sitting on the bookshelf (in case you were wondering where I put it). 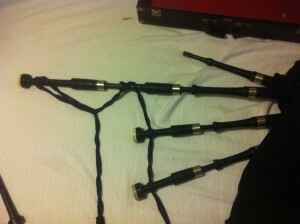 My buddy has too many bagpipes. Which is great for me, as I get to muck about with the ones he’s not playing now and again. But, today was a special occassion, he lent me his babies. A set of 1920ish ebony Robertson’s that have had the casein ringcaps and bushes replaced with moose antler by Michael MacHarg. They are otherwise flat combed with nickel ferrules. Droooool……. 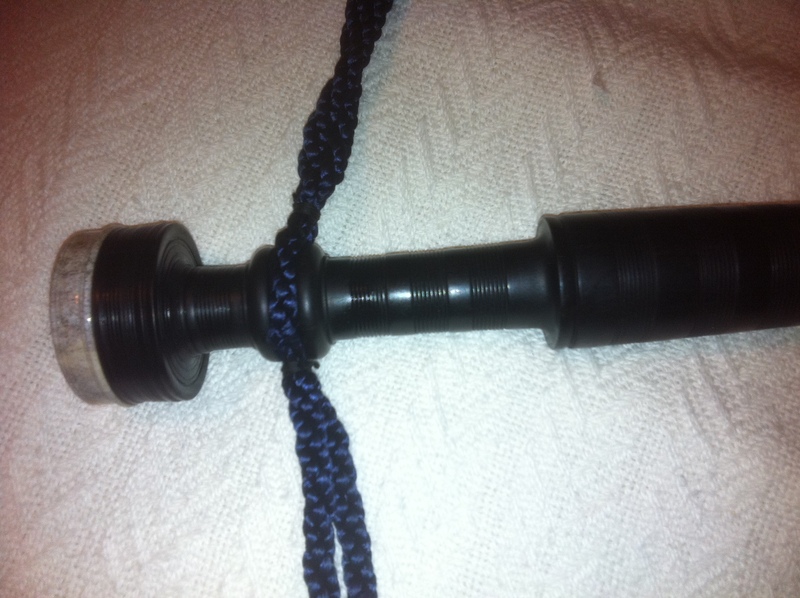 Kron poly chanter with Gilmour reed, I think. Enjoy! Edit: I wasn’t too happy with the above recording, but I’m not too happy with this one either. The reed was sharp on the top hand in the Colin Kyo chanter, especially high G, which gave rise to a few odd sounding grace notes due to the heavy taping required. While dunking a reed in water for a little bit will certainly make it easier, it seems to compromise the reed as well. Oh well. I’ll have to think on this practice some more as a viable way to ease up reeds that arrive in the mail that require 50+ inches of water to make a sound. Anyways, here’s the MSR where I apparently forgot what part I was playing in the strathspey. This post addresses several things: 1. Inveran chanter 2. Drone reeds in my 1950ish Henderson’s 3. Effect of easy chanter reed on my left ring/pinkie fingers and that mess. 1. I’ve got an easy reed in this Inveran chanter, very easy. My non-piping wife got a few seconds out of it with all drones going. The whole top hand is sharp relative to high A. I thought, dang. So, I tried a bunch of reeds; straight cut, ridge cut; dry, soaked in water: no change. The high G is half covered with tape. So, I don’t know. It’s a great sounding chanter despite all the tape, as it suffers no ill effect as far as I can tell, except that for some reeds, the amount of tape on high G can make finding the sweet spot difficult. Not so with this reed though. Note that the little chirps that occur on high G grace notes to/on low G are a result of the easy strength of the reed. 2. Redwood tenor and Colin Kyo bass drone reeds in my 1950ish Hendersons. I like! More stable than my previous setup. The kids were asleep so this was recorded not in the bedroom, as usual, but in our walk-in closet, hence the bigger chanter sound relative to the drones compared to the recordings directly below. I figured Inveran should be the next chanter I add to my modern chanter review. I haven’t yet because I need to make sure something is a reed issue and not a chanter issue before I make a final verdict. Right now, I’ve quite a bit of tape on high G and it’s making it difficult to settle the note, so hopefully this reed is just ill-suited. The reed required some tape on the McC2 as well, so this is probably the case. Below you’ll find recordings of it using that same reed as the Gael/McC2 comparison earlier, again recorded in Marr bagpipes with Redwood tenor and Selbie bass drone reeds and also in my 1950’s Henderson’s which are giving me fits at the moment, but they always have, though intermittently. I’ve got a synthetic bag on them now and I’m wondering if that’s the issue, so I’ll have to hemp them up for my Gannaway and see if they still do their weird thing. Crozier Cane tenor and Ezeedrone bass drone reeds in there right now. You’ll have to cut me a little slack, I gave blood on Wednesday, and the second recording was after a picnic where I wore myself out, I think I cough in the recording too, oops. 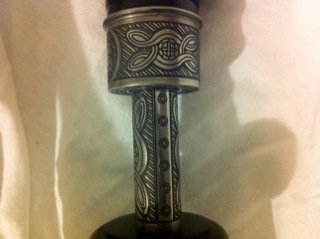 Oh yeah, the chanter is poly, and it arrived in the mail today! 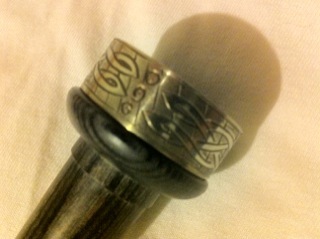 It is Inveran’s new Donaldson Master chanter. Back to my solo pipe! Well, during the drone optimization party referenced two posts below this one, I switched back to Kinnaird tenors and a Wygent bass, but the Wygent bass was being temperamental and making tuning my E really hard, so I went with an all Kinnaird set up. I think this Wygent bass reed is just worn out, it’s really old. As usual, a blackwood Colin Kyo chanter with Gilmour reed backed by a magnificent stand of Tim Gellaitry blackwood drones. PURE MAGIC, I say. I was about to put them away when I felt compelled to play this tune, so the first part is me putting the chanter in the right spot, if you were wondering. 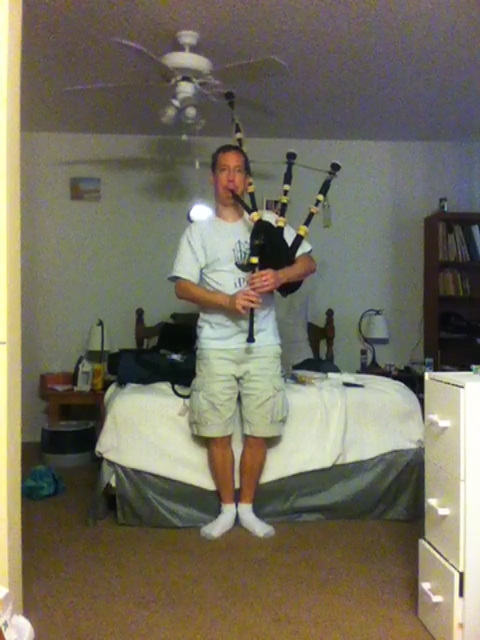 Thanks to Michael for sending in this recording of him playing an MSR on his Hardie’s Henderson pipes with a Colin Kyo laminate chanter. He’s playing Canning tenors and a Shepherd cane bass, pipe chanter reed has red binding, so I guessed Higgins or MacLellan. Michael says he loves the chanter, and I certainly know why, LOL! Murray Huggins, maker of Colin Kyo chanters and pipes did a cool engraving job on the chanter sole to match the engraving on the pipes. You may recall from recent post that a friend of mine won some Marr bagpipes. So, just the other day we had a drone reed optimization party to get the best drone reeds for each pipe. Out of Redwood, Henderson Harmonic Deluxe, Ezeedrone, Selbie, Wygent, Kinnaird, Colin Kyo, and Crozier cane we settled on Redwood tenors and a Selbie bass in the Marr’s. The Redwood tenors are very bright and solid while the Selbie bass gave a very deep and broad bass tone. Both he and I have never had much luck with the Redwood bass reed, regardless of pipe. Though the subject of another blog post, my Gellaitry’s ended up with Kinnaird tenors and a Wygent bass. Other reeds of note were the Crozier cane and Henderson Harmonic Deluxe tenor reeds. Before we get to the recordings, a little bit about the chanters. 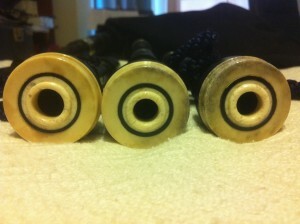 There’s a thread on the bobdunsire.com forums at the moment that is a review of Bb chanters. Although the Gael is a 470 Hz chanter (not 466 Hz Bb), it is the first to be reviewed and a direct comparison is made in one post between the Gael and McC2 chanters. Specifically, that they are not too different pitch wise (Gael ~3 Hz flatter) and so one might as well go with the McC2 as the commonly accepted superior chanter (ya know, Willie McCallum designed it and all (though Jim McGillivray designed the Gael, also note the Gael was designed as a band chanter for lower grade bands to get their pitch down)). So, I’ve got both of those chanters in poly. So what follows are the same tunes played on the same Marr bagpipe with the same drone and chanter reeds, the only difference being the chanter. For those into such things, the drones are tied into a grommetted Gannaway bag. So, you’re bored of reading my discourse now, so on to the recordings! Oh wait, the Gael came in at 472 Hz, the McC2 at 480 Hz. That’s a difference of 8 Hz for those of you too lazy to do the math yourself. Also, I’m walking around in a circle relative to the recorder (a Zoom H2), so you’ll hear tenor, bass, and chanter dominant parts as I walk around. Also, sorry about the lip seal noises, I passed my dissertation defense at the expense of not practicing for the last 2 months. The B on the Gael was a teeny bit flat. I’ve got tape on C, D, and F. The high G is in tune when I remember to blow out the high A. The McC2 is pretty well balanced with tape on high G, F, E, C, and low A.